Below are the links. As I mentioned I haven't decided on the back splash and do not have the a pciture of the butcher block. Your cabinet is a classic flat panel. This will fit well with your traditional style. It is not too dark. Wood darkens over time and you would not expect a light toned wood in an older home. Also your other elements – floor and counter are not dark. Of course it is always hard to get a true look at color from pictures. Other factors that will affect the lightness / darkness of your kitchen are your paint color, back splash, lighting, number and size of windows and how much sun they get. You also mentioned your trim will be white and that will brighten things up too. I also have wood cabinets with white millwork and it works. The chrome handles should look fine even with the brass in the rest of the house. You should design your kitchen how you want – that is the bottom line. I will throw out some thoughts, but remember it is your kitchen. Your granite is lovely. It has a lot of movement to it, so personally I would pick a simple backsplash that does not compete with the counter. 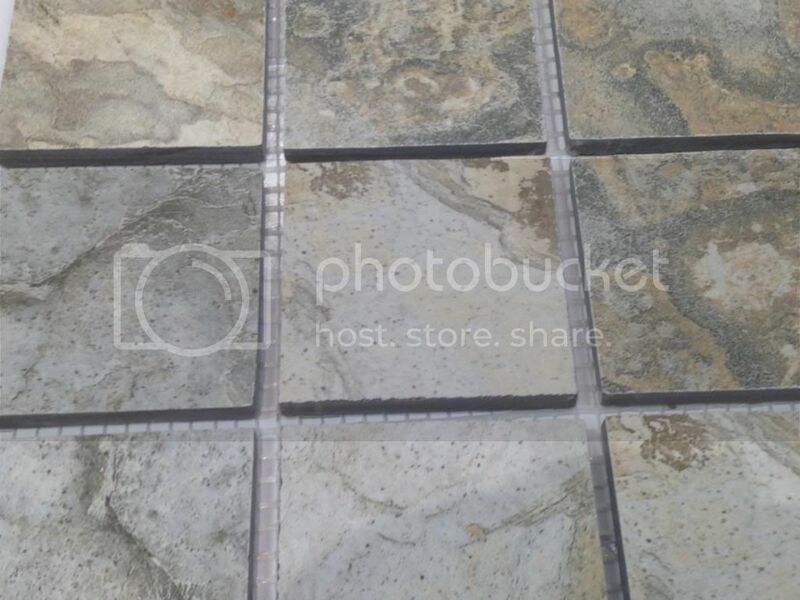 Look for a subway style tile or other tile that compliments the colors in the granite. Take your sample of granite to the tile store and hold it up to different tiles and see what works for you. The small, multicolored glass tile backsplashes are very in right now, but they can look busy and I think would be too busy for your granite. Some are very pretty, but they do have the potential to become dated, so again I suggest a simple backsplash. I like the tile for the floor – it appears to be on a mesh which makes me think they are smallish tiles. One of the biggest complaints I hear about tile is keeping grout clean. Smaller tiles mean more grout, which means more grout to look dirty, cracked or stained. First, use a grey grout because it has the easiest upkeep and should work with your tile. Consider using a 12 x 12 tiles as this is the more classic look for a kitchen. Smaller tiles are more usual in bathrooms. You need to go over to the John Bridge Tile Forum to check out whether your floor joist are capable of supporting the tile as they are, or if the joist need to be reinforced. They have a formula over there to figure that out. You will also probably need to add to the subfloor as whatever you have for subfloor is almost definitely not sufficient. Failure to check the joist and use the proper subflooring will result in a failed and cracked floor in a few years or even just a few months. Also, if your floor is very uneven, you will need to consider that. You mentioned veneered cabinets. In my experience, most good quality wood cabinets have solid wood doors and solid wood stiles and rails (the wood part that faces the kitchen and is around the door.) Often the carcass is made of plywood and the cabinet might have a veneer over the plywood sides of the cabinet – for example the sides flanking the sink. Often, a wood panel can be placed over this veneer if wanted on sides that are visible. If your doors, rails or stiles are veneer, I would be uncertain of the quality. Hopefully, one of the guys here who knows more about cabinets will comment. If not, start another thread asking about it if you are concerned. Even my cabinets, mid quality from a big box store, have solid wood doors, stiles and rails. Your picks for your kitchen are not really 1949 period – except the handles, but I don’t think that is a problem. They are classic and traditional so should go well with your personal style and blend with the rest of your house. You are right on that the kitchen will not be period. My goal was to bring in elements from the 40s and 50s and have it look good. Hopefully the handles (could be a shade lighter), the subway tile (color to be determined later) and the butcher block brings in these elements. I know the granite really doesn’t fit the time period. The green is similar to the color palettes I found for Art Deco and Mid Century (http://www.retroplanet.com/blog/retro-design/retro-decorating-ideas/elements-of-1940s-retro-decorating-style/). I looked at quartz but I would have had to buy more than I need to do the size of my kitchen. It was something to do with having to be a certain amount. 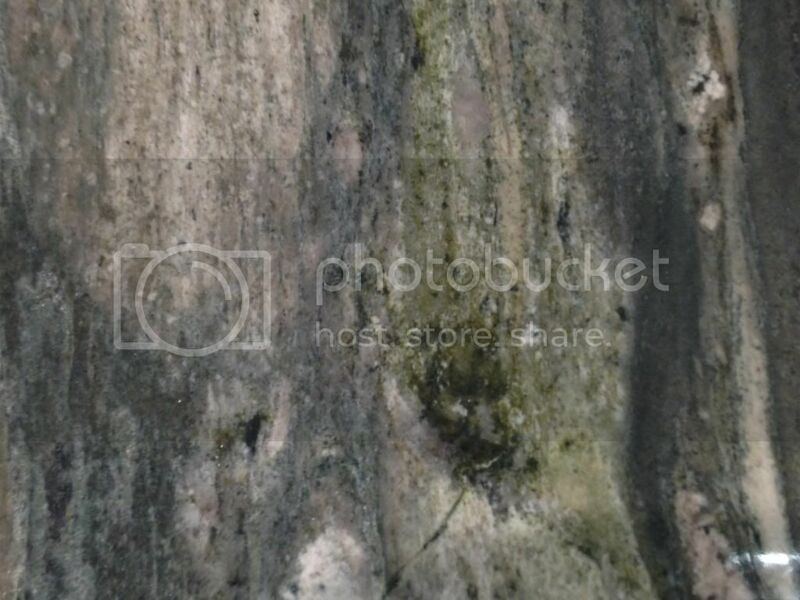 The colors in the granite have some similarities to the colors in the living room furniture. The tile floor will not be the size from the photograph. This was jus he sample the company had on hand. It will be the size that you mentioned 12x12. The current tiles in the kitchen are much bigger and it looks odd. I really wanted to do a white / black checkerboard pattern but I was overruled by the other half however his sister things that will look really neat. In the end I could get what I want. I agree with your comments about a simple subway tile back splash. The thought is to have that tie in with the subway tile in the 2 bathrooms. 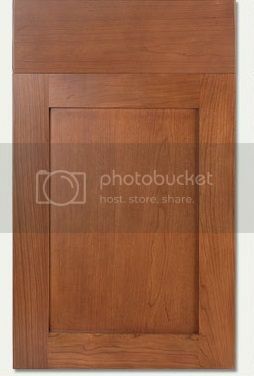 I do have other style choices for the cabinet doors (http://www.stmartincabinetry.com/content.asp?id=14). Based on what I was able to find this was the closest that I could find to some of the door fronts that I saw. There is a basic front that looks more like a slab type door. This particular door has veneer doors and drawer front over a plywood door. The one from the photograph has center plan with a hardwood veneer with the top slab part being made of solid wood. I wanted white but again lost that battle. His sister agrees with me. One of the things I was thinking about was to have the butcher block with legs similar to the door handles. The kitchen is just over 100 sq feet. It has two windows and a door. The main window is a good size while the second window is much smaller. Unfortunately the kitchen does not get a lot of sun do to its position and the trees in the yard. The paint color and lighting is still undetermined. I am pretty sure we are not doing recessed lighting but that is still up for discussion. A retro light fixture with some chrome would add a little period charm. I think every room needs a bit of whimsy. Good task lighting is helpful especially in a small kitchen. I am not one for recessed lighting, but I’ve seen it done very well too. I would start a thread about your cabinets if you are concerned about the veneer. One of the carpenter / remodelers would have more experience with that. Good luck on your design – I will be away for the holiday weekend. I took a look at your cabinets linked in your last post. It is actually a very modern looking cabinet. I know what you mean by its having that 40’s look as appears in the pictures of 40’s kitchens in which cabinets were often painted metal, but it is dark and not metal and might look very modern as opposed to 1940’s. I also am not sure you can get that style so that it will go up to the ceiling. If you like it a lot then that is what is most important, but I will also say that it is a style that is less popular than the cabinet you posted first – the traditional flat panel. If you plan on being in your house a long time, then suit yourself. If you are thinking of selling in the near future, the traditional flat panel cabinet will have broader appeal and might be more flexible in designing a cabinet that goes up to the ceiling. Cabinets in either white or wood will work. White will be brighter, but wood is warmer. If you go with white, add some wood in the décor to warm things up. The butcher block will help. You mentioned Amish furniture earlier. In my area, they make kitchen cabinets too. I am going to be in the house for a long time. After 81 houses and 2 real estate agents, I am not planning on going anywhere anytime soon. I am planning on going with white cabinets. Trying to find a style that goes with the late 40s / early 50s style is hard. Since we know that I am trying to create an "inspired by" as opposed to "vintage" things don't have to be exact. These are two vastly different concepts. Over the weekend I had a Nicole Curtis moment when we were taking out some of the flooring that went from the kitchen to a hallway linking to the living room. Under 3 layers of floors and a couple of subfloors is oak hardwood that matches the rest of the house. It was very exciting since that is what I was hoping for. We also discovered that there use to be swinging kitchen doors. I would love to find some that I could add back. Those hardwood floors are a great find. The white cabinets will brighten the small space and the wood floors will give it warmth. It should look really beautiful when you are done. Since you are ripping up floors you must be on your way to getting your kitchen remodel done. You are probably beyond inspiration pics, but since you like Nicole Curtis, she has some lovely kitchens on her Pinterest page. If you cannot find swinging doors, you might be able to have a carpenter make you a pair. It really helps even when doing your own remodel to know a good and friendly carpenter. I didn't explain that well. It is just the hallway between the living room and kitchen. The kitchen does have wood. It is unfinished pine with a ton of adhesive. The rest of the house is oak. Nope still searching for some inspiration. We haven't ordered yet. Still trying to decide on the cabinets. The remodeling company uses another brand that I think I like better. They have models without veneer (http://www.designcraftcabinets.com/doorsdc). We tore up the floor on our own. My partner's brother in law has a lot of construction background. You could put the tile you like down for flooring, but you could also finish the pine – is it the subfloor? Pine is not as hard as oak, but it might work – perhaps a little more vintage than you had in mind. Even though there was tile there before, do the floor check I mentioned from the John Bridge tile forum before putting down new tile. I’ve removed adhesive with an ice chipper – the kind used on the driveway to break up ice after an ice storm. Also, heating the adhesive up a little helps. I hate taking up floors. As you demo for remodeling keep in mind that there is asbestos in many older homes (pre 1978 mostly) so take some precautions, especially with old linoleum. Some other products also have asbestos. If in doubt, post under "safety" discussion. Be kind to your brother in law – always want a helpful construction guy around. Thank you for bantering back and forth with me while I decided on my design elements. I went to Pinterest and several good examples for kitchen cabinets. In some cases it was hard to tell whether the kitchens were 20s, 30s 40s or 50s. Based on photos I went and looked at the cabinet styles from the link I included yesterday. I think these will be better since they are not made of veneer. For some reason veneer just bugs me. Below are the ones I like. Hopefully one or more fit the style I am trying to achieve. The cabinets would be made of maple since this is the only wood that comes in white. We are not doing any more of the kitchen demo. All we wanted to see was if there was wood under the few layers of floor. It looks like the original vinyl was removed. The first layer of floor in the kitchens looks to be 50s or 60s.